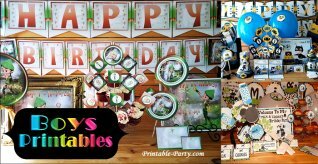 All party printables on this site are created and designed by Printable-Party.com and are copyright. Printable are not for resale and are for personal use only. 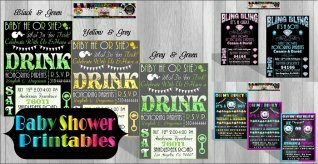 Printable party supply and all printable designs are intended for you to print on your home printer. You can print the supplies as many times as you'd like, Which means you can print them over and over as long as you have the files forever. You may also save your purchased files to a disk or flash drive and take it be printed at your local copy store, office depot, staples, etc. For those of you who do not have access to a printer, You have the option of ordering your printable supplies through us. We offer print & ship services. Do You Offer Event Services & What Kind Of Event Services Do You Offer? How & When Will I Receive My Printables After I Make A Purchase From This Site? What Are Printable-Party.com Studios Operation Hours & Shipping Times? Print & Ship Service Information & How Does It Work? How Can I Add Text Onto My Purchased Printables To Personalize My Products? How Many Times Can I Print Pages Of Supply In My Order? Why Do Printables Look A Slightly Different Color When Printing? Do I Need To Have An Expensive Printer To Print My Supply? 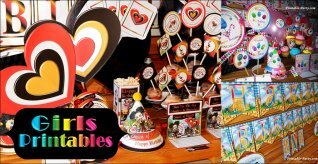 What Materials Do I Need To Assemble My Printable Party Supply? Can I Print From My Mobile Phone or Tablet? Why Do Some Of Our Designs Have 3D Effects In Them? What Printable Items Do You Personalized & How Will I Receive Them? Can You Design A Party Theme For Me? Why Are All Of The Printables Based On Different Prices? Shipping Return Policy for Purchases. Digital Goods & Shipped Paper Goods. Can You Personalize Printables for me? 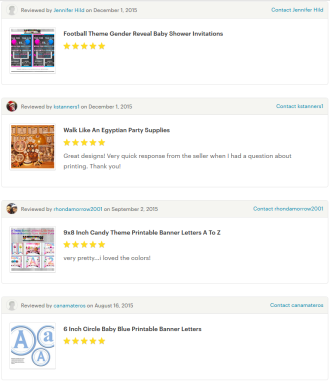 How & When Will I Receive My Printables After I Purchase From This Site? All purchases are very secure and are processed though PayPal, sellfy, & printable-party.com. During your purchase & checkout please be sure to enter a valid email address to where you'd like your order to be delivered. Printable purchases are immediately delivered to your email address after purchasing. Files are also given to you instantly through a link right after your purchase & checkout. Be sure to check your spam or junk folder too, just in case your order gets sent there by accident. Please be sure to click the product file link and save it to your computer or file storage device for safe keeping, lifetime use & ownership, so you can print your products over and over again for life. ﻿All files are sent to you in PDF format and cannot be changed or altered in anyway. Some files are delivered with a link and some or delivered in a folder and compressed to make the size smaller. What Are Your Operation Hours & Shipping Times? Why Does Some Of Our Designs Have 3D Effects In Them? We love to be creative to the T! Some of our printable designs have 3D effects & shiny effects in them to make them look enhanced. Your printer will more than likely begin to flatten some of the images and letters in the design before & during your printing process. Some or all printable designs may contain these effects for your notice. All prices vary per printable design & item. All prices are based around the complexity of the design or item and the time that has been consumed in creation process of the designed item or printables. We try to keep all prices at a reasonable rate and we are cheaper than most if not all printable design shops online with good quality designs. The best part about printables is that you can keep your files forever and print as many as you want or need to decorate. You can use the same printable file year after year if you'd like & all for one low price. Unlike most party supplies shops & stores where you purchase an item for one time use and waste money. You will still need to purchase tableware and balloons etc. We only sell decoration paper goods and PDF files to embellish already made items like water bottles, cups, utensils, balloons, cupcakes etc. You cannot print from mobile devices because you must open your PDF file in Free Adobe Reader. We are sure you can order or purchase supplies from your mobile device as long as you enter a valid Email address when ordering your product to where you want it sent. Your order link will be sent to your email address. All of our printables are made into non editable PDF files. Most newer computers already have a PDF reader installed on them. We always suggest that you download and update your Adobe PDF Reader to the newest version available. If you don't have a PDF reader installed on your computer, You will have to download one in order to view any of the printables purchased from this site. How Do I Add Text Onto Printables To Personalize My Products? After adding text everywhere you'd like on your product pages, You can save the file on your computer in another name so that you don't overwrite the original product file purchased. There is no limit to how many times you can print. You can print any page in your order and file as many times as you'd like or need. The file is yours to keep forever and as long as you keep it safe. Just make sure you save the file to your computer or storage device and you have it to print as long as you want. Remember files are all copyright by Printable-Party.com and there is no sharing, redistributing, and not for resale as your own. Made for personal use only. Every one of our printable digital files are sized to fit on standard 8.5x11 letter sized paper. We suggest using thickest 8.5x11 matte photo paper or card stock paper you can find when printing party supply. Using thick 65- 110 pound paper usually works and looks best. Printable-Party.com uses 110 lb bright white card stock paper & An EPSON WorkForce Pro WP-4530 All-in-One Printer when printing supplies for displays, parties, and customer orders. You can find this kind of paper at your local office supply store. We recommend paying a visit to Staples, Office Depot, or Office Max if in the USA for printing supplies. You can save on ink by using the fast draft setting on your printer when printing supply. If your not concern with saving ink and would like high quality images when printing our supplies, Open your files with the adobe reader and select print and then properties. Select your paper type and the quality you'd like your prints to be printed in and the page numbers you'd like to print. After you download your files they will probably end up in your download folder on your computer. You can find them easily by clicking the start button located on the lower right corner of your computer screen. You will then see a search box located right above the start button. Type in the name of the printable file that you ordered and click search. The folder should pop up, Just click it and you can start your printing process or move them to another location on your computer by dragging. No you do not need to own or print on an expensive printer for your supplies to look good. We have used inexpensive printers to print supplies on in the past and they work just fine. Just be sure to select properties after you select the print button, so you can select the paper and quality type you'd like to use. Print & Ship Services, How Does It Work? You can order print & ship services from us. We print on 110 pound bright white card stock paper. We use the thickest quality paper. We will print your order and place all your papers in a big yellow envelope or flat box and ship it to you. We ship world wide. We suggest you place orders at least 3-4 weeks or more before your celebration to allow yourself time to trim out & assemble your printed pages. Attention! - We (do not) cut, trim, or assemble your party supplies order. We only offer print & ship services. We will only print out your 8.5x11 party pack or single item pages, We will then proceed to process & mail all the papers included in your party supply order + full assembly instructions to you. Assembly & trimming is required by you & instructions are provided to help you assemble the printables. You can also download your file from your computer onto a disk or flash drive and take it to your nearest copy shop. Staples, Office depot, & Office Max print personal orders. You can also go online to Fed Ex formally called Kinko's and upload your files online to be printed & shipped to you. The things you may need includes a sharp pair of scissors, glue, hole puncher, & string at minimal. If you like to get really crafty and make your items look even jazzier, You can use brads, 2 inch craft paper punch for cupcake toppers, eyelets, ribbon. feathers, double sided tape, pom poms, small wooden sticks, & curling ribbon. 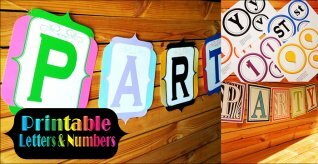 DO NOT reproduce, share or manipulate copyrighted Printable Party Printables in any way. This means any re-sale items on e-Bay, etsy, blog, your own site/store or products for business use is strictly prohibited. DO NOT rename any file and call it your own. DO NOT create a layout, design or product with Printables for others in return for compensation without express permission from the creators of the works or commercial license. Due to the digital nature of our products, items are not refundable, exchangeable or returnable. All sales are final after download occurs. If you are not satisfied with our product, please contact us for a mutually agreeable resolution. Can You Personalize or Design A Party Theme For Me? 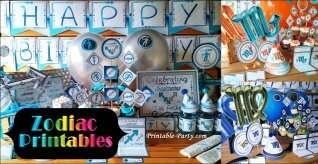 At this time we cannot personalize or design a specific party supply package for you being that we are very busy processing orders, But we are open to suggestions and ideas you may have for a new party theme or printable party designs. We do plan on adding printable items that we will personalize with names, photos, & ages, sometime soon. Feel free to leave us a message or post on our Printable-Party.com Facebook Timeline to let us know about a design you'd like to see in the Printable-Party.com Studio Store & and other ideas or concerns you may have regarding this website.